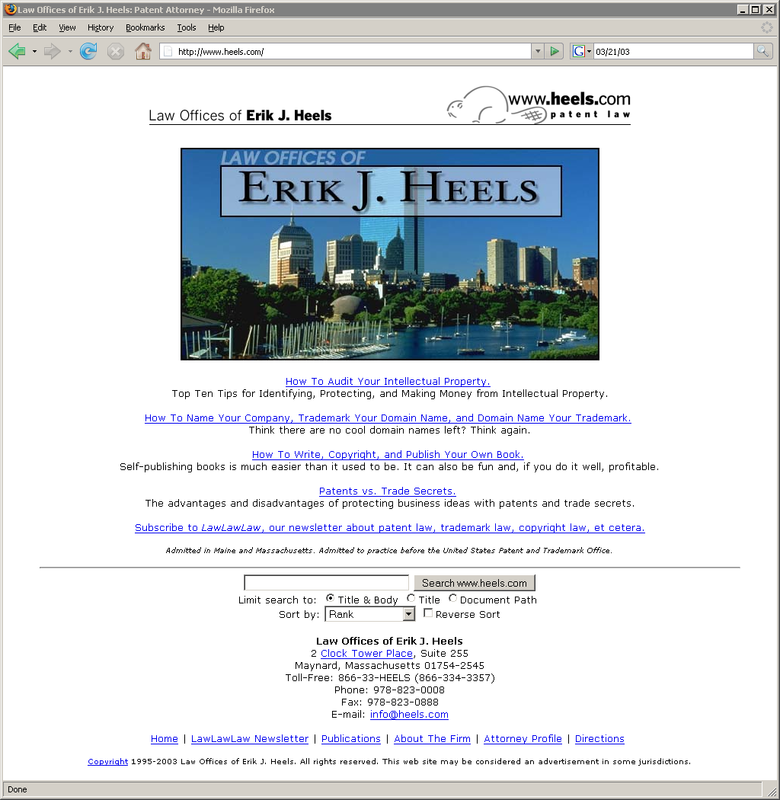 My website is 10 years old today, my law firm is 6 years old today. The Evolution Of A Website. 03/21/97. 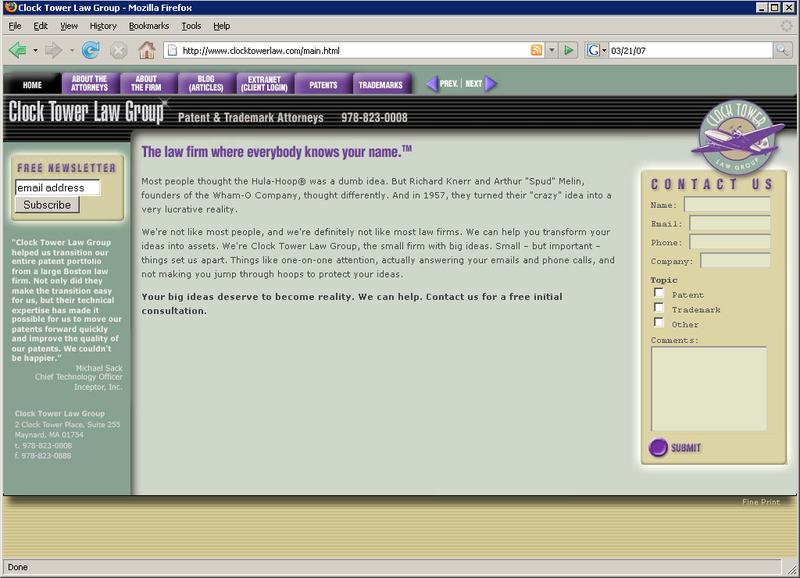 My law firm’s website was born. I was two years into what would prove to be a six-year hiatus from my law practice. I was living in Marlboro, MA, and working in Waltham, MA, for Inherent.com (as VP of Marketing and Sales), and my website was an example of Inherent.com’s ://Presence product. 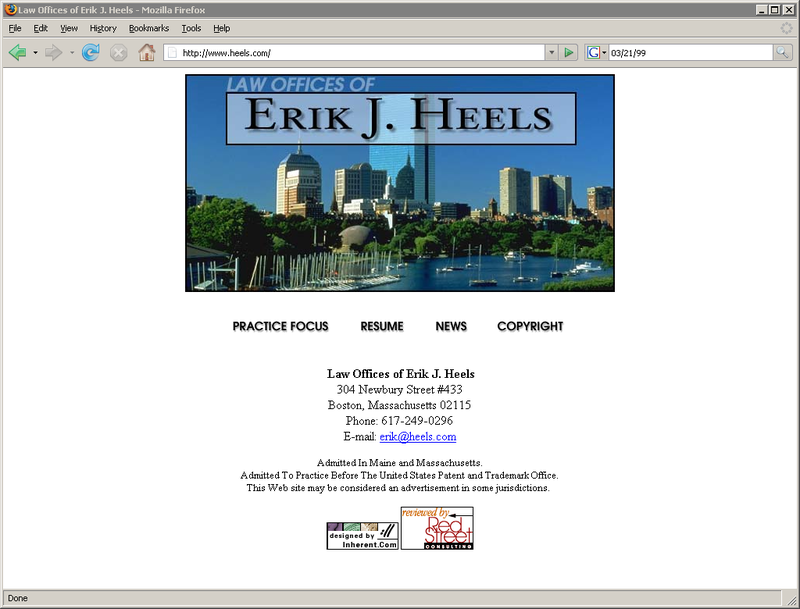 For the foreseeable future, my law firm website would be a placeholder for my future law practice. The home page was designed for a smaller (600×800) monitor and featured a photo of the Boston skyline. 03/21/98. My law firm’s website turned one year old, and I first experimented with making it into a blog. I republished articles (that I’d previously written for the ABA) on the home page itself, which was unheard of in 1998. I also included a notification form (powered by the now defunct URL Minder service from NetMind) so users could get email when the site was updated. Meanwhile at Inherent.com, we were trying to convince lawyers to get websites. 03/21/99. My law firm’s website turned two years old. The law firm moved to Boston while I moved to Denver to work for Verio. I reverted back to the non-blog home page, presumably because I was busy with my day job. 03/21/00. My law firm’s website turned three years old. No change from the previous year. I continued to pay my bar dues and to refer all cases I got to other firms. I was still living in Denver working for Verio. 03/21/01. My law firm’s website turned four years old. Verio had been sold for $6 billion cash, I had moved back to the Boston area, and I launched my solo law practice. It is a coincidence that the birthday of my law firm is also the birthday of my law firm’s website, and it is admittedly odd that my website is four years older than my law firm. But I had always planned on returning to my law practice after the Internet stopped being fun, and when the dot-com bubble burst in 2000, it was pretty clear that the fun was over. I was working from my home-office in Acton and looking for office space. 03/21/02. 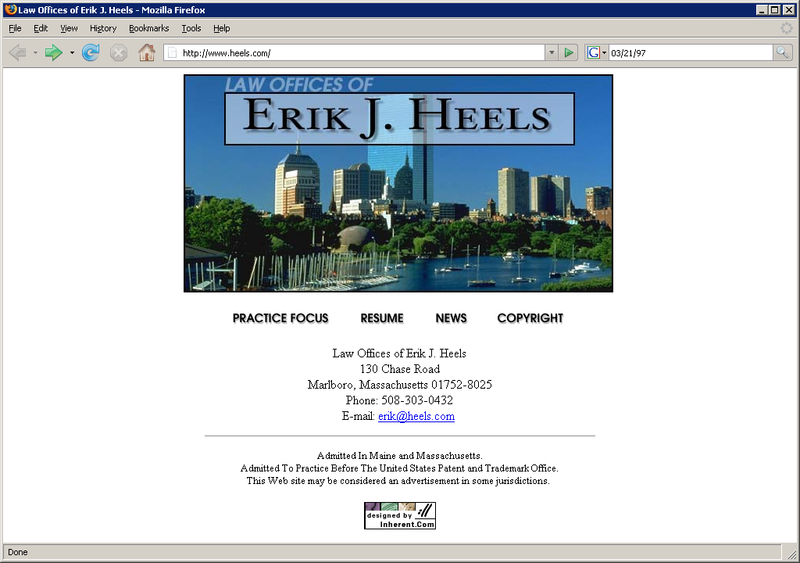 My law firm’s website turned five years old. I was working from office space in Maynard, an old mill building, the former headquarters of Digital Equipment Corporation (DEC) and the current headquarters of Monster.com. I added a search engine to the home page and links to two legal “how to” articles. I also added the stylized heels.com beaver logo to the header of the home page, making the home page look like my stationery and business cards. 03/21/03. My law firm’s website turned six years old. I guess I got the seven-year itch one year early, because this was the time for lots of experimentation. I added advanced searching and sorting features to the search engine. I added a link to subscribe to my LawLawLaw newsletter. And I included links to four legal “how to” articles. I experimented with weblogs. But since it was an experiment, I launched it under another domain name (beaverlaw.com). OK, perhaps not the best choice. But you’ve got to be willing to experiment, to take chances, to innovate. 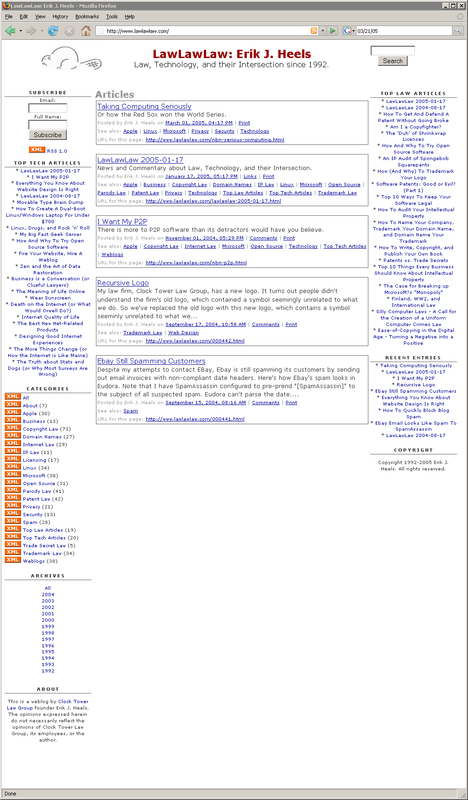 This particular iteration of the weblog was powered by Radio Userland and employed outlining. 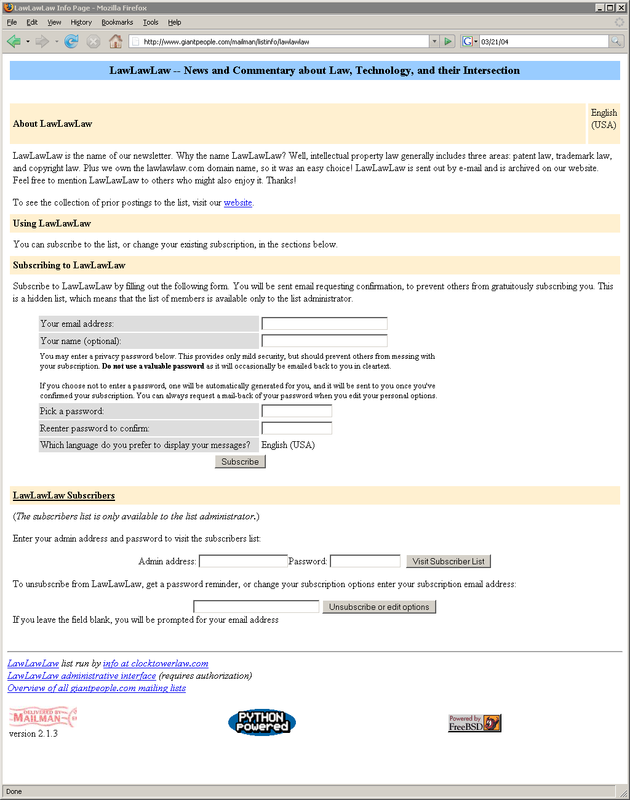 I started my LawLawLaw newsletter, powered by Mailman, and I customized the LawLawLaw signup page to look like the website home page. 03/21/04. My law firm’s website turned seven years old. And it was a year of more change. Primarily, the change of the name of the law firm. The old domain name was heels.com and the old firm name was Law Office of Erik J. Heels. When I was redesigning my website, I put up this placeholder. In the lower-right corner, I wrote “The firm’s name has changed. Coming soon – our new website. Until then, click here.” It was a Haiku, but nobody noticed. Underneath, it was a blog powered by Movable Type. The new domain name was clocktowerlaw.com and the new firm name was Clock Tower Law Group (as of 01/01/04). 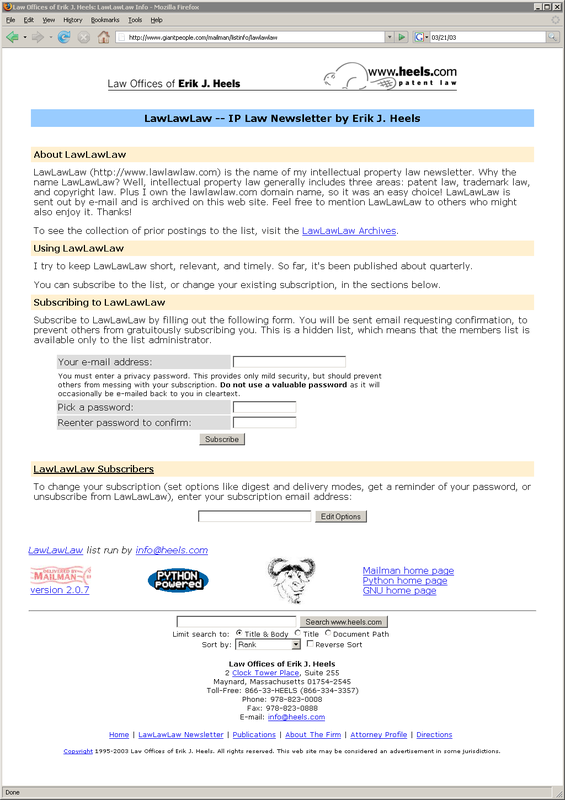 Mailman signup page for the LawLawLaw newsletter. 03/21/05. My law firm’s website turned eight years old. But it was sporting a new look. 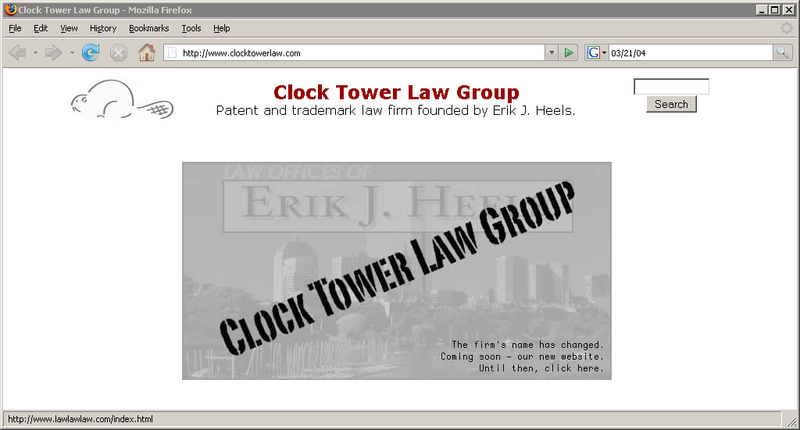 The website’s Flash intro tells the story of how Clock Tower Law Group is different than large law firms. It uses a retro 1950s theme. 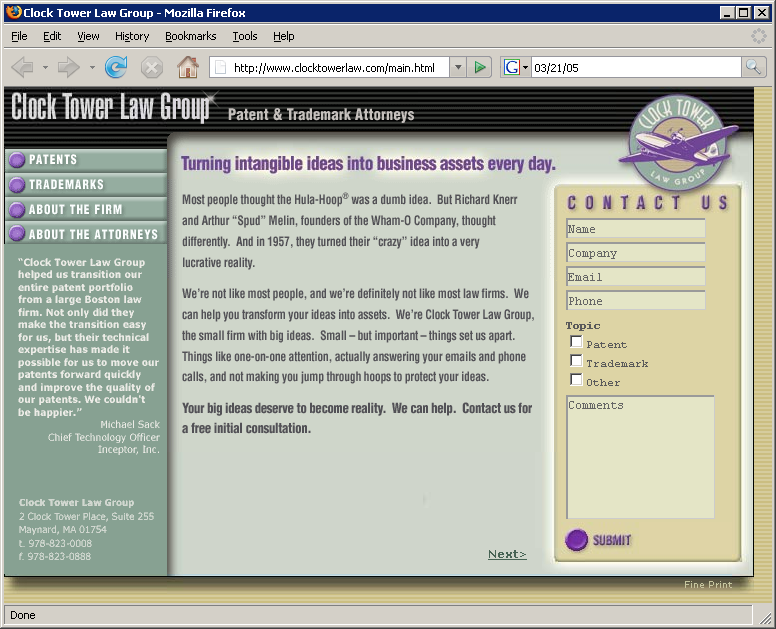 The fixed-width home page features a persistent contact form and a “next” link to continue the storytelling of the Flash intro. Because the contact form is on every page, users don’t have to look for it. I merged the LawLawLaw newsletter and the blog under the lawlawlaw.com domain. Five article summaries are on the home page, which was, shall we say, very link-heavy. 03/21/06. My law firm’s website turned nine years old. The Flash intro page and the home page remained the same as the previous year. 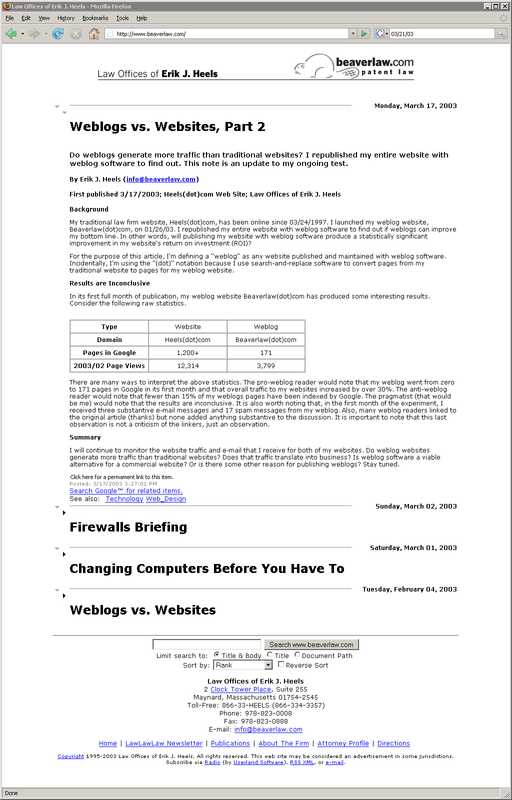 I continued to experiment with the blog, adding Google AdSense ads and many more links. Summaries of, I believe, 90 days worth of blog posts appeared on the home page, making it (in hindsight) huge and even more link-heavy than the previous year. 03/21/07. 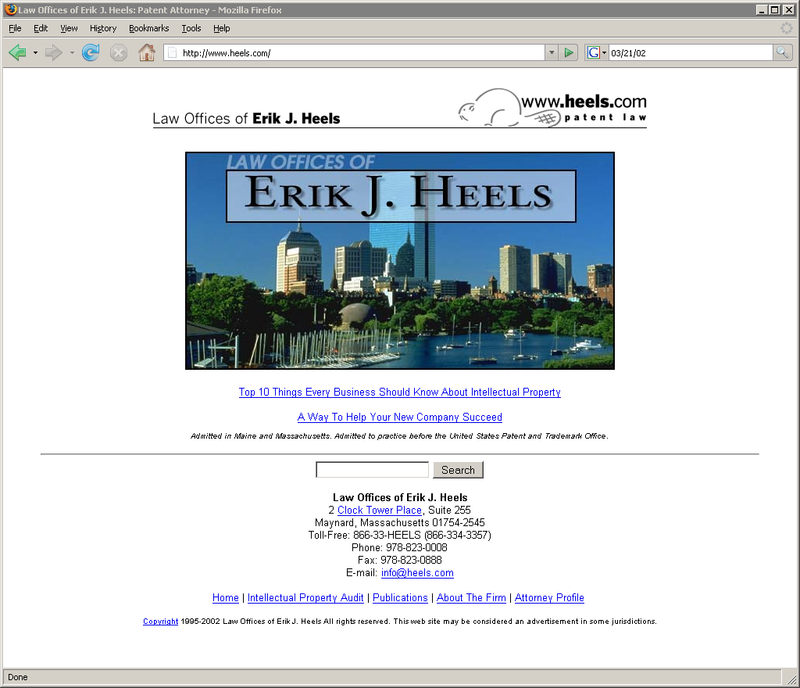 Today, my law firm’s website is ten years old. I made some subtle but important changes to the website. It is fluid now, not static, so it supports different size monitors. Top tabs are designed to help with search engine optimization. The image on the home page has been replaced with its text equivalent. And I added a persistent newsletter signup form. The blog is now powered by WordPress. Only two articles (full text) are featured on the home page. There are fewer links, which is another way of saying “less clutter.” Like the website, the blog has a persistent newsletter signup form and a persistent contact form. 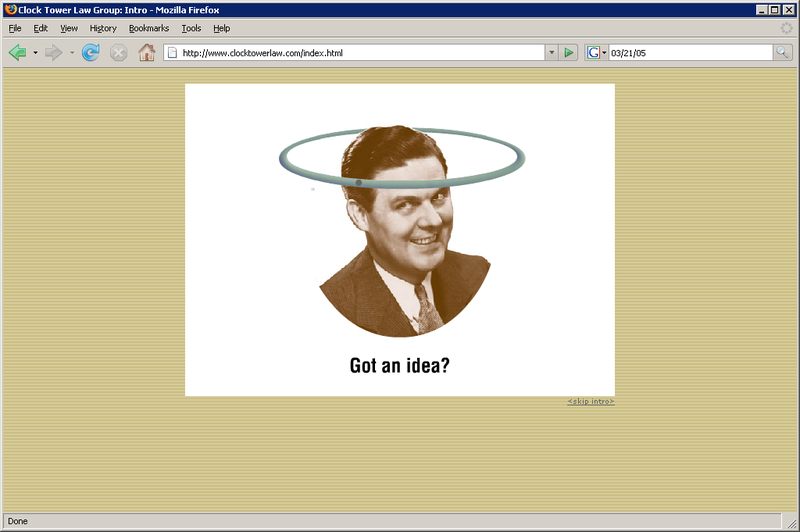 And it has its own domain name (erikjheels.com). The newsletter and the blog are no longer combined. The LawLawLaw newsletter remains an email subscription service, now powered by Constant Contact (no longer Mailman), and the newsletter is also posted to the blog. The lawlawlaw.com website redirects to a the LawLawLaw category page on the blog. Since the two-article-per-page setting from the blog also applies to the LawLawLaw home page, it is still a lot of text on one page. Perhaps I should work on editing the newsletter for length. I’ve been on the Internet since 1984, registered my first domain name in 1992 (justice.eliot.me.us), registered my first dot-com domain name in 1995 (heels.com), and launched my website in 1997. While I am proud of my accomplishments Internet-wise to date, I am not done. The one constant over the first decade of my law firm’s website has been change. And as long as the Internet changes, I’ll be changing my website, so you can expect more changes in the future. See you next year.